Stuga Ecoline stand-alone machining centre for fast and efficient prepping of uPVC window and door frames including 'V' notching, trickle vents, drainage, espags and all door preps including letter plates. Run by barcodes, the Ecoline works well with a Stuga Autocut saw centre or with a double mitre saw. 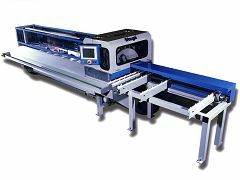 Cut pieces are scanned with the on-board barcode scanner, placed on the infeed table and then the process is automated with the finished pieces returning back to the operator for placement in a trolley. Fast, efficient and accurate, the latest version is even quicker and more versatile than previous ones. The Ecoline we currently have feeds from right to left and will be fully and properly refurbished in the Stuga factory coming complete with a 12 months parts and labour warranty. More details are available at www.stuga.co.uk or call 01493 742348.